Educational requirements for Summit County refugees 18 years and older are serviced through Project Learn, an organization spearheading the English for Speakers of Other Languages (ESOL) instruction. Project Learn is part of Adult Basic and Literacy Education (ABLE) through the state of Ohio and is funded by the Ohio Board of Regents. It also receives support from United Way of Summit County, GAR and Akron Community Foundation. Project Learn partners with local refugee resettlement organizations, including International Institute of Akron (IIA), Asian Services in Action (ASIA) and World Relief, to administer classes. There are 64 different countries represented in Project Learn’s ESOL program, with over 40 languages spoken. At any one time, there are 20 classes held at various sites throughout the county, with a current enrollment of 550 students, many of whom are refugees. These distinctive and striking people have also created a new crop of Asian markets piled floor to ceiling with rice-filled burlap sacks, shelves of dried mango powder, cardamom pods, fermented millet wine and in back, goat meat and pig’s feet. New cafes feature the popular cuisine of momo (dumplings) and thukpa (noodle soup). The many who are non-Christian, congregate in temples practicing Hindu and Buddhism. The youth form their own soccer clubs and also play cricket. These tight-knit families can also be seen on warm, sunny days fishing, frogging, berrying and ‘shrooming all along the city’s nature trails. It’s been more than four years since Rohit Biswa’s seen his aunt, uncle and cousins. Like many of Akron’s between 500 and 600 newly resettled refugees each year, Biswa’s family has taken this journey in staggered groups over the past decade. The trip itself is an arduous one, 30 hours of flights stretched out over three days. On a recent evening, Biswa and International Institute of Akron colleague and caseworker Eilis McCulloh hopped into a car with an Akronist photographer to pick up these remaining relatives and open up a brand new chapter of their lives. The reunion began at Akron-Canton Regional Airport and continued into the evening, and Biswa’s family now can take comfort that they’re in Akron together as a complete unit for the first time, with much more freedom and space than that found within the all-too-familiar confines of a refugee camp. Biswa, who came to Akron in 2010, has made this drive dozens of times as part of his job for the International Institute, picking up arriving refugees, along with helping clients with interpretation and applying for benefits, among other tasks. He also is heavily involved in the community, serving as a youth pastor at Akron Bhutanese Assembly in the North Hill neighborhood. The International Institute makes around three pickups a week to this airport, 150 a year, to help begin the resettlement period for refugees, which usually lasts 90 days. Once these new residents become acclimated, the agency offers employment placement services for up to five years, says McCullough. Before his resettlement, all Biswa knew was life in a refugee camp, where he spent more than 20 years — including his childhood, and even into high school and early adulthood. He and his wife married in the refugee camp while teenagers. He never thought he’d make it the U.S., a fabled land of golden opportunity and bustling and crammed big cities. “We never thought we’d get a chance to go,” he says. There are more than 40,000 Nepali refugees and asylum seekers, according to the Office of the United Nations High Commission for Refugees, which adds that poverty, malnutrition and overcrowding plague the camps throughout Southeast Asia. As Biswa pulls into the airport parking lot, he admits that he asked his other family members in Akron to meet the arriving relatives later in the evening, but they came to the airport in a sizable group because they were too anxious to wait. They want to greet the family members as soon as they step off the plane. “Today we have many people that are going to see them at the airport,” Biswa says. So the family reunion starts earlier than planned. And that’s why his brother is bringing a van. Like many Bhutanese-Nepali families, Biswa’s shares resources among extended families, with many generations living together and caring for one another. This helps provide a safety net for newly resettled family members, many with houses already waiting for them. There are 4,000 Bhutanese-Nepalis in Akron, and this sharing nature has translated into neighborhood transformation, like local gardens, new businesses and more community minded activities, along with food, art and culture. 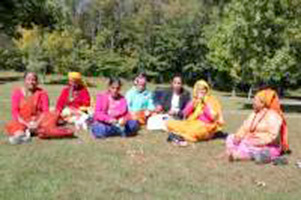 Another common thread among Akron’s Bhutanese-Nepali population is their thankfulness for the guidance and resources provided by the International Institute of Akron, which is a critical link to the city for these and many other refugees and immigrants. The journey from Nepal to Akron usually requires 30 hours of travel over three days, passing through multiple countries and continents. After stepping off the plane, Biswa’s uncle says that he was scared traveling for 26 hours, it being his first time riding an airplane. Biswa remembers when he came to Akron in 2010. “After six months, I had a hard time understanding doctors and other different types of people,” he says. He took English as Second Language (ESL) classes, and sought the help of the International Institute. Biswa says there are some things he misses from Nepal, like cultural festivals and friends who were left behind. For more information, visit www.iiakron.org, or visit the agency’s Facebook and Twitteraccounts.